Three years after the release of their third album The Light Years Of The Darkness in 2015, British jazz collective Emanative return with Earth, a new album of ambitious genre-melting music. It finds Emanative channelling the spirit of Sun Ra, but also drawing inspiration from Floating Point’s unique brand if cinematic experimentation. The result is Earth, which was recently released by Jazzman Records. This is the fourth album from Emanative, who have been led by drummer and producer Nick Woodmansey for the past decade. The name Woodmansey will ring a bell with many record buyers, especially fans of David Bowie, who will remember Mick ‘Woody’ Woodmansey who was the drummer on Spiders from Mars. Mick had a son, Nick Woodmansey who was born in 1975, and from an early age, music was part of his life. It was almost inevitable that Nick Woodmansey would sooner, rather than later, follow in his father’s footsteps. Nick Woodmansey had one of the best teachers an aspiring drummer could hope to have as he began to learn the drums. Mick taught his son Nick Woodmansey the basics of drumming, which gave him a good grounding and was the start of a lifelong passion for the drums. Back then, neither Mick nor his son had any idea that a musical career beckoned for Nick Woodmansey. He planned to go to art college, but his plans were put on hold when sixteen year old Nick Woodmansey moved into a Dalston squat in 1991, and became part of London’s eclectic and vibrant music scene. This was all part of Nick Woodmansey’s musical apprenticeship. A few years later, Nick Woodmansey’s musical apprenticeship continued when he spent a year playing drums in a band on a cruise ship. This was good experience for Nick Woodmansey when he arrived back on terra firma. Over the next ten years, Nick Woodmansey became a familiar face on the London music, and was involved in various musical projects. Still he found time to raise a family whilst working as a full-time musician. However, in 2006 Nick Woodmansey decided launch his own jazz collective Emanative. After two years honing their sound and playing live, Emanative released their debut single What On Earth in 2008. This was followed up by the Spacebeats EP. It featured a tantalising taste of Emanative’s debut album Space which was released in 2009 and found favour with critics. Buoyed by the success and response to Space, Emanative returned in 2010 with their genre-melting sophomore album Time. It was released to plaudits and praise and Emanative’s star was in the ascendancy. Over the next three years, released just two singles. The first was Lions Of Judah in 2011, which was a collaboration between Emanative and Ahmed Abdullah who was Sun Ra’s trumpeter. Then on the ‘18th’ of November 2013, Emanative released Over as a single. It featured appearances by Earl Zinger and RocketNumber9 on what was the latest chapter in the Emanative story. Less than two years later, and Emanative returned with their third album The Light Years Of The Darkness, which featured a cast of top musicians. This included Keiran Hebden a.k.a Four Tet and trumpeter Ahmed Abdulla. The Light Years Of The Darkness was released to widespread critical acclaim and was seen as Emanative’s breakthrough album. However, it’s also an album that was supporting a good cause. When The Light Years Of The Darkness was released on Gilles Peterson’s Brownswood label in 2015, all profits were being donated to the Steve Reid Foundation. It’s a charity founded by Gilles Peterson, and Nick Woodmansey is a trustee. The charity baring the name of the legendary jazz drummer had been setup to support musicians in crisis and up-and-coming musicians. Emanative’s decision to support the project was admirable, and his breakthrough album The Light Years Of The Darkness introduced the jazz collective’s music to a new and wider audience. Over the next three years, Emanative released the single Ominous Shanti in 2017, and followed it up with Planet B in 2018. Meanwhile, the members of Emanative were preparing to release their fourth album Earth. 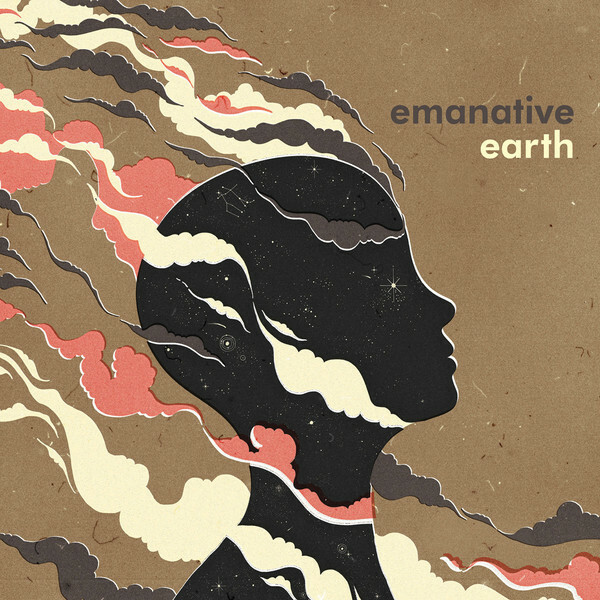 Emanative’s fourth album was their most ambitious and was a truly eclectic offering from the British based jazz collective. Led by drummer Nick Woodmansey who produced Earth, he and the rest of Emanative combine African, Asian, Indian and Middle Eastern influences with jazz of the spiritual and free variety.To do this, Nick Woodmansey put together what can only be described as an all-star band. This included Manchester-based musician Nat Birchall, Malcolm Catto of The Heliocentrics, Idris Ackamoor of American spiritual jazz group The Pyramids and Afrobeat legend Dele Sosimi who was once a member of Fela Kuti’s Africa 80. They were joined by Ben Hadwen of Ibibio Sound Machine, RocketNumberNine’s Benjamin Page and Flying Lotus collaborator Ahu. The final member of this all-star band was Sarathy Korwar who was born and brought up in India and is a talented artist whose signed to Ninja Tunes and has collaborated with Shabaka Hutchings. When they arrived at the studio, Nick Woodmansey had a request for his multitalented band. As Nick Woodmansey spoke to his band about the project, he encouraged his dig deeper into their spirituality. Thinking back to the project he says: “when you work with guys like Ahmed and Idris (Ackamoor), spiritual people, their vibe, attitude rubs off on you…I’m not religious but I am very spiritual: my perspective on life is less materialistic, more humanitarian. It’s important to see both the negative and the positive in life–but a spiritual perspective is inherently positive–you look for the good in things”. They were certainly on the same page musically as Emanative recorded the eleven tracks on Earth. The result is ambitious, captivating and innovative album where Emanative channel the spirit of Sun Ra’s unique brand of space jazz on an album where they mix global influences, religion and politics on Earth. Dawn Child (Sunrise) opens Earth, features a welcome in French from Atrobal, which gives way to Indian classical music and closes with a raga. This sets the scene for the rest of Earth, including Heaven’s Mirror where Idris Ackamoor and David Molina of The Pyramids play starring roles during a track where constellations map civilisations and join the dots between Egypt, Ethiopia, Thailand and Meso-America. Ìyáàmi is jazz-tinged and soulful shootout to motherhood that swings and as Dele Sosimi delivers an impassioned vocal. Spice Route Suite is powerful and thought-provoking as Nat Birchall plays minor-key saxophone whilst the rest of Emanative use spice to symbolise the cultural trade route that has flows between the East and West for centuries. It gives way to the evocative and cinematic Sandhyavandanam where Vedic prayers are recited at midday as the sun beats down. Meanwhile, Emanative deploys a flute, rubab. and sarod to create an authentic backdrop as they continue to paint pictures with music. There’s social comments a plenty on Ecosystem (Solar Noon) which is dramatic and sometimes discordant as Emanative criticise and condemn what they believe is a so-called “inner clique” who try to outdo each other. Reflection gives the listener as a chance to reflect as Emanative unleash what’s best described as Liz Elensky delivers dramatic prose where opposites abound as they’re set to melodic music. Equally melodic, soulful, jazz-tinged and hook-laden is New Day which initially seems hopeful and joyous. Sadly, this hope and joy is short-lived as Ahu delivers one of the finest vocals on Earth. Heaven’s Mirror (Reprise) finds Nat Birchall’s dancing saxophone taking centre as beep punctuate an arrangement that is best described as celestial imitation. It’s another carefully crafted and ambitious track from jazz collective Emanative. So is Minutes To Midnight For This Planet, which was inspired by the legendary free jazz pioneer Sun Ra. He once said: “it’s about one minute to midnight for this planet,” and here Emanative try to recreate the concept of this pre-apocalyptic minute . Closing Earth Raga Requiem (Dusk) which deals with the subject of death. Atheists and scientists realised that death is the end, while religion talks of heaven and hell, and of afterlife where spirits exist. Emanative try to recreate the sounds of heaven and hell and the afterlife during Earth Raga Requiem (Dusk). It another thought-provoking and cinematic track full of imagery. Twelve years after Nick Woodmansey founded Emanative, they released Earth, which is a truly ambitious, groundbreaking genre-melting album. It features an all-star cast and finds Emanative fusing African, Asian, Indian and Middle Eastern influences with various varieties of jazz. This includes contemporary jazz, free jazz, soul jazz, spiritual jazz. There’s even elements of electronica, Indian classical music, Middle Eastern trance and soul on the eleven tracks on Earth, which is the fourth album from Emanative. While The Light Years Of The Darkness was Emanative’s breakthrough album, Earth is a career-defining album from Nick Woodmansey’s jazz collective who with a little help from his friends created an ambitious, innovative and thought-provoking opus. ← THE LIGHTMEN-FREE AS YOU WANNA BE.